We've made way for ducklings. No not the beloved Robert McCloskey's Make Way for Ducklings book, but real feathered and webbed, good natured ducklings. Our family grew, ahem... well, the feathered family members that is. 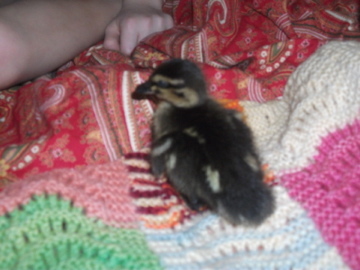 Two newly hatched mallard ducks have come to live with us. They are so calm and amenable to being held. Dolly doesn't seem to notice, as long as she can sleep, she is happy. Just look at those webbed feet, so solid on the earth and so ready for a swim any time. We wonder if they have imprinted on Duncan for they are following him around. Dunkie's ducklings. They are adorable. 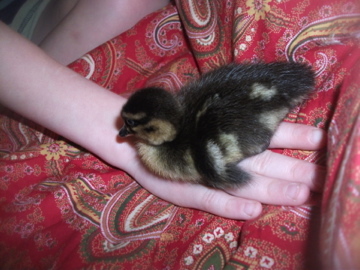 We got ducklings last spring-they grow so fast! I love ducks so much, I have a whole flock of them ... at the dream house in my head! they are so, so sweet! We used to LOVE that book when we were young. I remember the drawings in brown and thinking how different that was. i also loved the expressions on the traffic cop's face. thank you for your kind and wise words! So cute!!! Are they inside much? I'd be afraid they'd make a mess, but I love that the little duckling is in the bed! With this unseasonably warm 70 + degree weather we've been having, we've been taking them out in the day. They follow Duncan to the lake and love to swim. Then take a long nap. Yet because they are still so young (2 weeks old) we keep them inside in a pen in the playroom next to a pen with baby chicks. They both have heating lights to keep them warm. 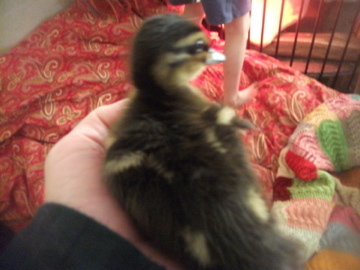 They have had a few drops when they escaped their pen in the night and roamed all over the room. We were able to see them and clean them up. Otherwise when we play with them, they haven't left any droppings on us or the bed. The bed you see we had put down in the playroom for house guests (beware future house guests!) 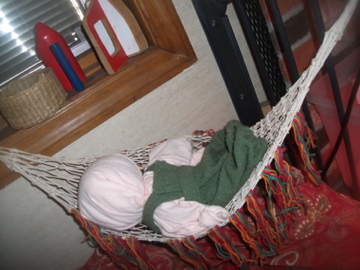 and then left it there because it is so cozy. (it is smack between our play kitchen and wood stove hearth. I'll try to get more pictures and put them up on the blog, it is a sweet little nook. We are so in love with these ducklings. They are so friendly and have so much personality. The chicks seem so dull compared to the ducklings.